Pattern Mixing... we have been talking about this exciting trend for ages (ok like less than a year, but forever in the fashion blogging world)... but it is looking to continue with even more gusto for Fall. So let's get to mixing. I saw Cupcakes and Cashmere wearing stripes and geometric prints, so I wore stripes and geometric prints (Mean Girls reference, anyone??)... and turns out, I think it rocks! Today I am linking up with MarionBerry Style's Trend of the month challenge. What are your favorite patterns to mix? Any that are off limits? Oh, and how sweet are these sunnies?! The most expensive pair I have ever owned... and I didn't even have to pay for them.... I WON them in a giveaway from Honey & Silk, and I cannot wait to wear these sophisticated sunglasses with Every.Thing! Thanks Stephanie! Supper cute! And thanks for the comment you left on my blog! Love your pattern mixing job! I love this trend. So fun and classy. Those shorts are amazing btw! I LOVE mixing patterns and this is so inspirational! Your shorts are amazing and look so cute paired with your striped top! I absolutely LOVE this look on you! And this look in general... so cute! Now I just need some patterned bottoms... hmmm, I'll put that on my fall list! I love this print mix!! The necklace is the perfect piece to bring both prints together! I love this pattern combination! Those shorts are beautiful. I love your style. I'm following you now via bloglovin. I'd love for you to follow back if you like! Yes you do! Pattered skirts, pants and shorts are on my wish list currently. Silky and patterned pants would be a total score for me! OOH I love this pattern mixing! love this shorts! Very cute, love the pattern on those shorts. This is absolutely adorable - you nailed this print mixing! These shorts are great - and the top works so well!! Found you from Marionberry Style and I'm your newest follower - can't wait to see more! I love this pattern mixing! Your necklace ties the two patterns together too :) Congrats on winning the sunnies! Aren't giveaway wins the best?! love the mixed prints here! Your necklace rocks too. Lovely pattern mixing! A striped tee is such a versatile piece of clothing in any closet! Found you at Marionberry style and loving your blog! Following you now on GFC. Oooh, I love those shorts!! 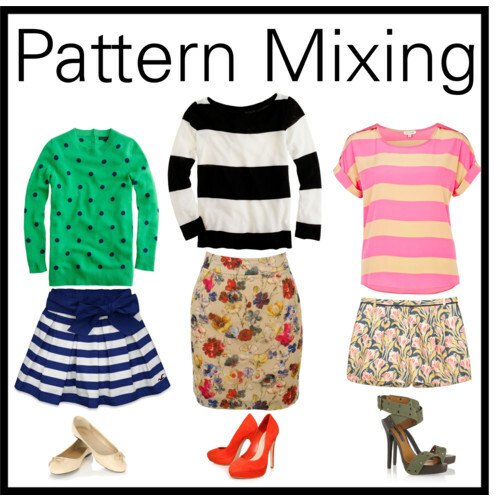 Awesome pattern mixing - you look great :) I also love the combinations you created, especially that middle one. I love the stripes and florals - they're just meant to go together! Also, after seeing you rocking your vest yesterday, I picked one up at Old Navy. I can't wait for fall so I can wear it all.the.time! Hands down...my favorite look of yours so far!!! I want those shorts!!! Are they recent? If not, can I buy them from you???? I am in LOVE!!!!!!! This is my favorite outfit you have shared on the blog! LOVE! Love it! This is a PERFECT example of GOOD pattern mixing. Some girls are so far off the mark, it's just sad. However you look awesome! I love your pattern mixing and I really love those shorts (as I've said before:)! I'm so into mixing up patterns and it really has become such a mainstay in my dressing that I just assume stripes go with everything! Aren't I right? haha so true - stripes have officially become a neutral in my closet! I love it!! I still have yet to do pattern mixing but I need to try!! I LOVE this look! Those shorts are absolutely amazing! Plus with your bubble necklace...perfection! You definitely rocked it. Yay - that is what I was going for! And yes, giveaways are amazing! I don't usually win ANYTHING! This is adorable! Love how you mixed these patterns.